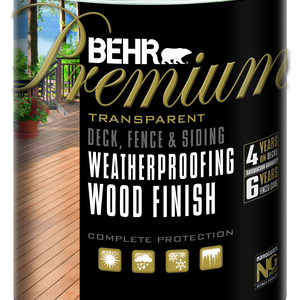 June 02, 2010 Santa Ana, Calif.
Behr introduces a reformulated line of Premium Exterior Weatherproofing Wood Stains and Finishes. 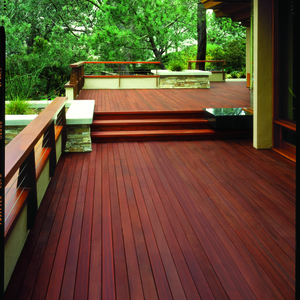 Utilizing an advanced 100 percent acrylic resin, the suite of products is able to protect decks, siding and fences from sun, rain, snow and ice and provide an incredible look that will last for years. The advanced formula allows the stains and finishes to penetrate even deeper into wood fibers and provide a superior adhesive bond to the wood substrate. Made with NanoGuard® technology, the improved formulation was developed to enhance resistance against moisture, UV damage and stains – the result is improved surface protection and longevity. Additional benefits include better adhesion which reduces the likelihood of peeling, improves performance over knots and increases color retention. Following the successful introduction of paint samples for the BEHR PREMIUM PLUS® and PREMIUM PLUS ULTRA® paint lines, Behr is also offering eight-ounce samples of Premium Solid Color and Premium Semi-Transparent Weatherproofing Wood Stains to allow consumers to test color and opacity before making larger product decisions or to use on smaller do-it-yourself projects. 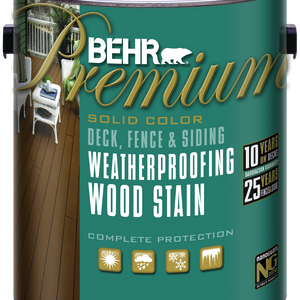 The BEHR Premium Solid Color Weatherproofing Stain is available in over 1,600 colors and has been formulated for computer color matching. The newly-reformulated BEHR Semi-Transparent Weatherproofing Stain is available in 83 custom colors. New label information, as well as online and in-store resources, have been added to provide assistance with determining product amounts for varying project sizes, applicator recommendations, product variety selection and project inspiration. More specifically, consumers will be able to interact with a refreshed WoodSmart by BEHR kiosk in The Home Depot stores. The kiosk is complete with a new video featuring stains/finishes application footage as well as inspirational deck, fence and siding imagery and more information about the new 8 ounce sample program. 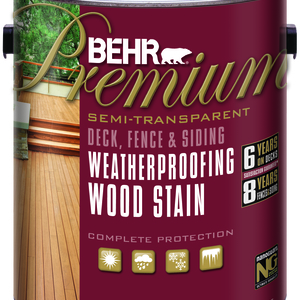 BEHR Premium Exterior Weatherproofing Wood Stains and Finishes are currently available exclusively at The Home Depot stores in gallon, five gallon and ½ pint sample sizes. More information is available at http://www.behr.com/. You can also follow BEHR on Twitter at twitter.com/behrpaint and friend BEHR on Facebook at facebook.com/pages/BehrPaint.